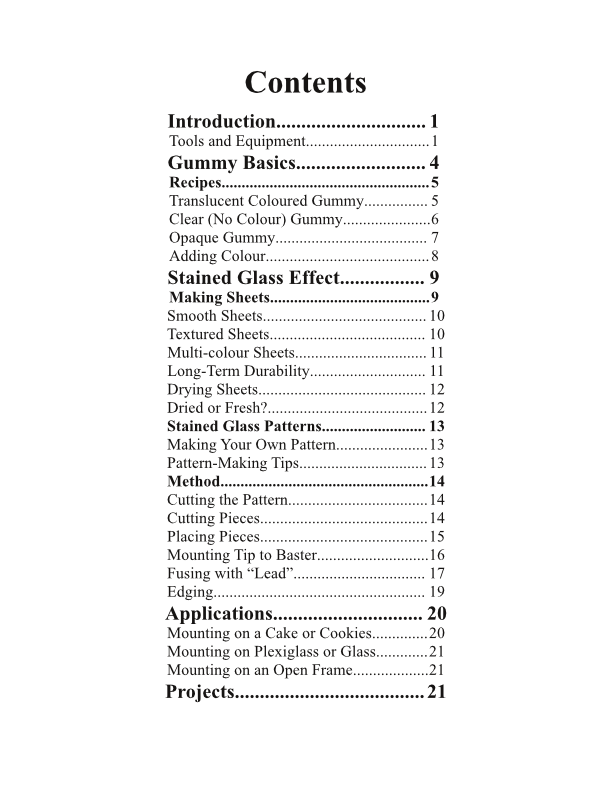 Now available: a photo-rich how-to manual for my gummy stained glass technique! Flexible, Edible Stained Glass eBook: only $15 at GumroadAlso available at Craftsy.com.This book will take you through the basics of making your own gummy candy, complete with three different recipes that give decorators literal and figurative flexibility in their designs. 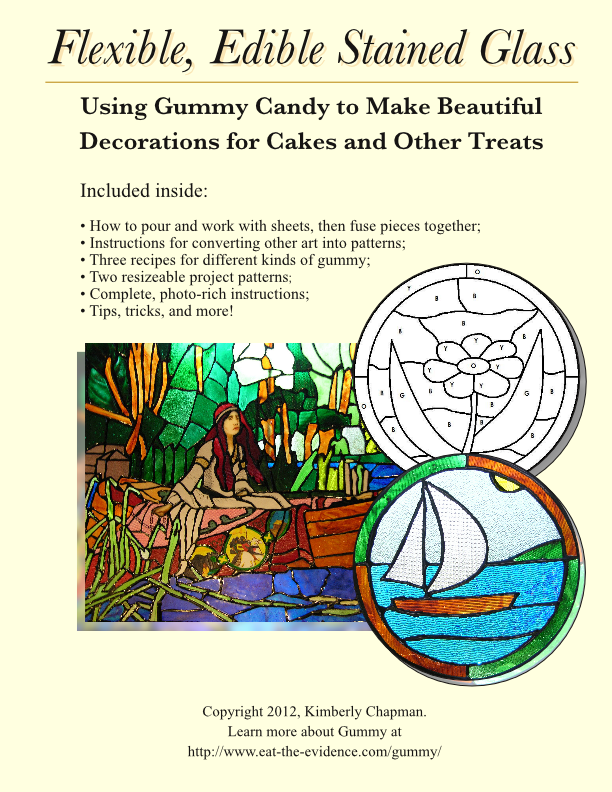 Next, it shows you how to turn those basics into fantastic results that will have everyone asking, “How on Earth did you do that?” Step-by-step photos and instructions illustrate just how easy it is to be creative and have fun with the newest medium in the sugar arts world. 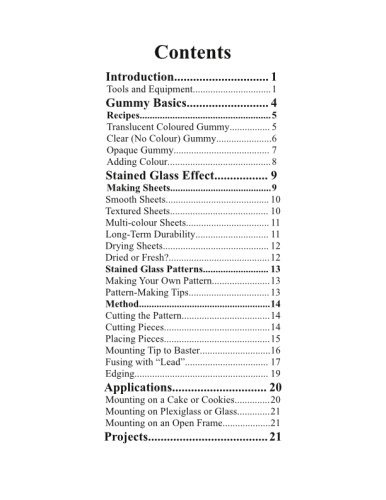 29 pages full of photos, instructions, patterns, and tips for beginner decorators through to professionals. The front and back cover plus Table of Contents are below. Click to enlarge. 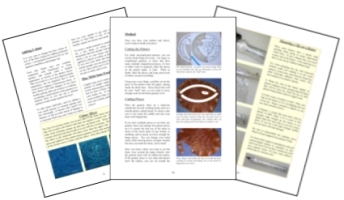 It is 29 pages in PDF format (cover to cover) with no digital rights management in order to be viewable on a variety of devices and allow for printing of the included patterns. I am hoping buyers will honour that in return by not spreading it around unfairly. Please let me know if you see it for sale or being distributed elsewhere! Listed equipment may cease to be available, or new products may pop up. Here’s a list of items I have personally used and recommend. Unless otherwise noted, I have not received any payment, endorsement, or communication for recommending these products. If you notice anything no longer available for sale, please say so in the comments. OXO Good Grips Turkey Baster with Cleaning Brush – A good baster is essential, and I have several of this model. I’ve provided an Amazon link but I highly recommend you go to a local store to test them as described in the book, since sometimes they have very rigid bulbs that don’t work as well. If you have found a different brand of baster that is consistently reliable, please let me know in comments! Revere 1-qt non-stick sauce pan – You can use other non-stick pots, but these little ones are really handy because they make for a deeper gummy pool. Knox Gelatin envelopes, 2 boxes of 32 envelopes – This is how I have been ordering gelatin because I use so much of it, although lately Amazon has been bad about keeping it in stock. It’s more expensive through other sellers, especially with shipping. Amazon usually has it for about $18-$19, so that plus another item from their store gets you free shipping. I may have to switch to another bulk supplier if Amazon doesn’t bring this product back. UPDATE: It hasn’t been sold like this by Amazon directly for a few months now, and the secondary sellers charge too much. I’ve started using the store brand from my local grocery store instead, which is better than previous store brands I’ve tested, but I still hope Amazon will bring back the dual Knox pack for less than $20. Gelatin Texture Mats – Disclosure: I won the set I used in this ebook as part of a prize pack in the Austin cake show competition, donated by Cake Connection. My set included a dot grid, parallel lines, wavy lines, houndstooth, and a random sandy pattern (this exact set may no longer be available but if you contact the store I’m sure they’ll help you out). 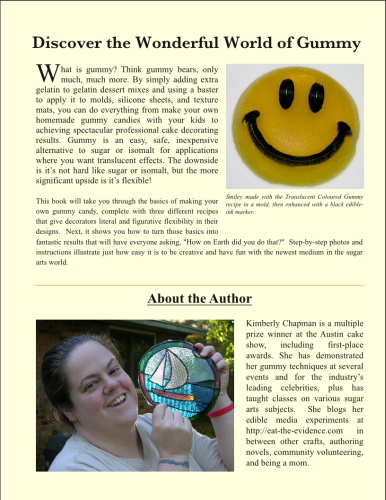 They’re not high-heat-safe, so be sure to let your gummy cool as much as possible before using, but I’ve used them for gummy many times with wonderful effects. Update: I have tested this technique using DecoGel by Icing Images and determined this new commercial gummy medium can be used, but because it doesn’t dry, fully fuse together, and may have some colour bleeding, there are some important limitations and caveats. See my full review post of DecoGel here. Update: in one of my classes teaching this technique, a student asked if they could use scissors instead of an X-Acto knife because she found the knives uncomfortable in her hand. The answer turned out to be yes. She was able to use small, very sharp scissors to cut her sheets just fine. An X-Acto blade gives a smoother cut, especially on curves, and is still the best way to remove error blobs of the leading, but if you don’t have one or don’t want to use one, scissors do work. Just be sure to handle your sheets carefully to avoid fingerprints. Update: I’ve posted a report on how long this medium stays flexible. Short answer: about five months until it starts cracking, and by seven months it’s brittle. 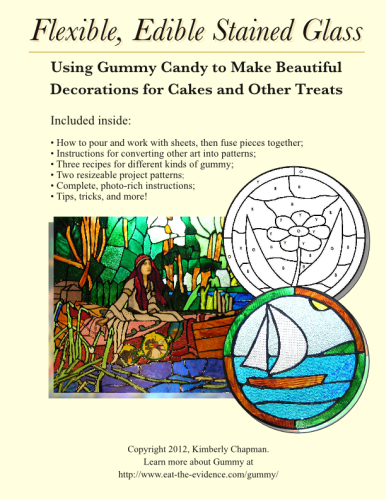 Flexible, Edible Stained Glass eBook: only $15 at GumroadAlso available at Craftsy.com. Wow, your glass technique is really an amazing work. And such decorations in cakes for special ceremonies make a good smile on everybody to tastes the sweet, now I really want to try this gummy candy tips on my next vanilla cake. Keep ore posts like this. The instructions of products is flexible as what you have made… I want to try this at home specially when christmass is coming it is a nice idea to combine it all..